Mit dieser wundervollen Verpaarung und den zu erwartenden Welpen, schließt sich ein weiteres Kapitel in unserem Matobo Hills Zuchtbuch. Es ist Liu Pilis letzter Wurf und deswegen soll es für sie und uns so besonders wie möglich sein. Deswegen haben wir uns dazu (um-)entschieden, unseren tollen Rüden Matobo Hills Colin Farai nocheinmal für Liu Pili zu nehmen. Wir hatten im letzten Wurf nur einen Fehler von 13 Welpen und sind absolut überzeugt und begeistert von den Charakteren ihrer Babies. Alles haben eine tolle Größe und sind glückliche und gesunde Junghunde. 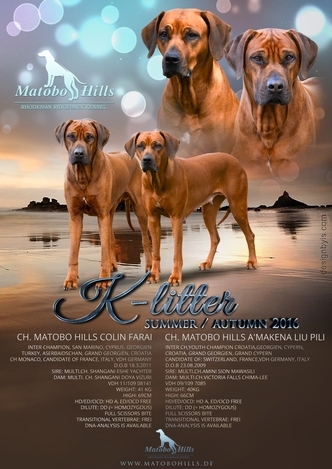 With this wonderful mating and expected puppies, there is another chapter concludes our Matobo Hills studbook. It is Liu Pilis last litter and that's why it makes so special for all of us. It is that's why we (re-) decided to take our beautiful male Matobo Hills Colin Farai once more for our Liu Pili. Our last litter with this dream couple we only had one incorrect puppy out of 13 puppies and all of them are absolutely convinced and impressed by the character of their babies. All of them have a great size and are happy and healthy young dogs.